A very ornamental conifer, Chamaecyparis obtusa Nana is commonly called the Hinoki cypress. This is a dwarf variety, slow growing and with very attractive foliage year round. It is a plant that would make an excellent addition to a rock garden. In a Japanese style garden it makes a standout specimen plant. The foliage is typical of the genus, fan like, a dull glossy appearance and held in attractive sprays. Best planted in a humus rich, moist but well drained soil. 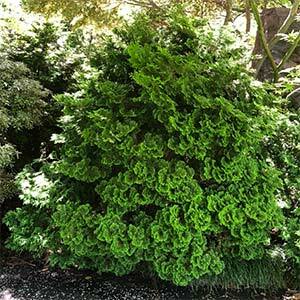 Chamaecyparis obtusa Nana will grow best in full sun, although in warmer climates a little afternoon shade will keep the foliage looking better. Before planting, dig in some well rotted compost and aged cow manure. Water the plant in well with a liquid seaweed fertiliser. You should mulch around the plant to maintain a cool root run. An annual application of a slow release general purpose fertiliser should be adequate, apply this in spring. At the same time renew the mulch, keeping to away from the trunk of the plant. Water well over the first few summers, and in extended dry periods later on. The method of propagation is from cuttings. Foliage – Mid green and with a slight drooping habit. Flowering time – Early summer to autumn.